Well, today is my last day to contact bloggerville until I reconnect at some point once situated in Connecticut. The Prez and I hit the road tomorrow. Yesterday was a beautiful sunny day here at our home in the Hollow and we got a lot accomplished. I did take the time to walk the gravel road with Moon and Copper in the morning as well as sit out with them for my afternoon break. It couldn't have been a more perfect day! Oh, sure, occasionally my eyes would tear up with the thought of saying good~bye, but then my mind focused on what lies ahead, bringing a smile and drier eyes. The Prez loaded the washer and dryer on the trailer along with a few of the "open me first" boxes and today, it's prepare the coolers, one with frozen, one with refrigerator items. He is using the dry ice method since we're looking at a time frame exceeding 24 hours. I will tell you another thing, if ever you move and have the need to pack strategically, contact the Prez. He got more stuff on that trailer than I imagined! Today I'm going to see Mike, my friend of eight years, the man who cuts my hair, the one I've had many adventures with. He and his entire family welcomed me with open arms right after we met and have always been strong shoulders (if you know what I mean). I know I will cry. But I also know that we will stay in touch just as I plan on doing with Lisa, Joyce and Bill, Linda and Dale, Dorothy and Harwell, Lucy and of course, Buddy. Writing this and thinking of them brings tears to my eyes, but remembering each of their smiles and laughter eases the pain of saying good~bye. 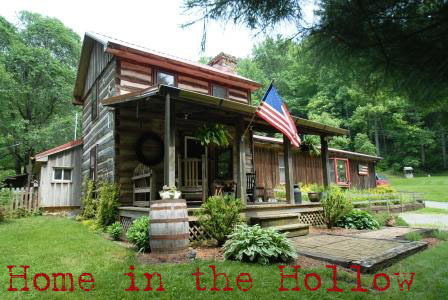 The Home in the Hollow has love to live on. Surrounded by Nature that's all good for you. I sure am happy for you, but I'm sad to see you go too. So glad we'll be certain to stay in touch through blogging :-) Happy adventures friend! I'd be sad to leave that wonderful place too! But as you said.. many things to look forward to. I hope this wonderful house is going to some wonderful people. I have to admit you have me feeling teary with your poem. Good luck - be careful and can't wait until your transition to the Quiet Place. Take care and get that internet up and running soon...We will all be waiting here for you. On to the great adventure. What a wonderful poem about your home in the hollow. I'm sure it's hard to leave. But I can't wait 'til you reconnect in blogger-land to tell us all about your new adventures! I'm sure you'll have some great stories! Have a safe trip. We will miss you until we hear from you again. That Prez is a great guy. Love your poem! Looking forward to the next page in the book :O). We'll miss your Hollow stories, but can't wait for the next part of the journey! Oh, JP you make me tear up here. I have loved you home in the hollow so much. I'm glad I caught up with you as you are about to move on. Wish you all the best with the trip, the unpacking, and settling in your new home. Looking forward to hearing all about it. And the poem is so great. I loved your poem. I hope your travels are safe and keep that smile on your face. It's a beautiful place, full of many wonderful memories. But, soon, you new home will be filled with even more wonderful memories. Have a safe trip. We'll see you when you can connect again. JP, leaving behind a home you obviously loved and friends as well is tough. I'm sure you will keep in touch and maybe they will visit the new homestead, which will be "home" before you know it. We may be facing a move ourselves within a year or so and know that getting everything packed and leaving is tough, but going someplace "new" is very exciting. see you...in your new place!! :) be safe! Reminds me of Walton's Mountain.